Provo • Perhaps the BYU basketball team should insist on shooting into a bent rim every night. The Cougars shot miserably in the first half of their 72-43 win over visiting Westminster College on Thursday night, then turned it around in the second half, especially from 3-point range. That’s notable, because at halftime the basket BYU was warming up on became slightly tilted. Players jarred it and hung on it, but nothing seemed to work. BYU has a backup basket and support, but the shot clock on it doesn’t work. So coach Dave Rose, knowing his team had just shot 43 percent from the field, 23 percent from 3-point range and 62 percent from the free-throw line, told the referees to start the second half anyway. “I said, ‘Hey, come on, we’ve all played on bent rims before,’” Rose said. The Cougars proceeded to shoot 50 percent from the field, 44 percent from long range and 75 percent from the free-throw line in the second half and pushed a 35-18 halftime lead to 33 points before the reserves took over in the final minutes. 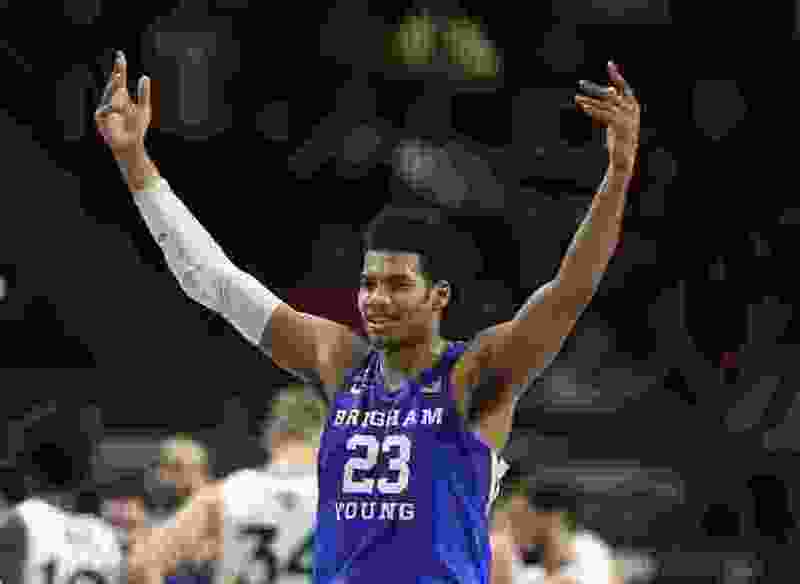 Yoeli Childs posted a double-double — 14 points and 14 rebounds — and TJ Haws, Dalton Nixon and Jahshire Hardnett also reached double figures for the Cougars. Westminster played well in spurts, but had trouble finishing at the rim against BYU’s superior size. The Griffins shot just 18 percent in the first half, 33 percent in the second. Former Highland High star Brandon Warr led Westminster with 12 points and Westlake High product Jacob McCord added 10. “Coach wasn’t very happy with us in the first half,” Childs said. Rose said the Cougars were in too big of a hurry. The Cougars missed their first nine 3-point attempts before Childs hit back-to-back treys and freshman Kolby Lee added another. “Thank goodness for Kolby,” Rose said. The Boise, Idaho, product missed the win over Saint Martin’s last week with a sore foot, so he can always say the first shot he took and made in a BYU uniform was a 3-pointer. “It was surreal,” he said. Both teams had a better offensive flow in the second half. McCord and Jake Connor, a Utah transfer, made 3-pointers for the Griffins, while Hardnett canned two for BYU in the first eight minutes of the second half. Rose was happy with the way his team responded after halftime, even on a damaged rim. “This is going to be a coachable team,” he said. The Cougars play for real on Tuesday when they open the season at No. 7-ranked Nevada.